⇒ [O] Little do you know. [OPEN] Little do you know. Sunlight pours from the blue skies, small puffy clouds floating by weightlessly, sparing the earth of more snow shower for just a little while longer. The dirt stands off of the earth like hairs on excited flesh, crunching loudly beneath dark hooves with each step. Ouija wanders silently out of sight, trying her hardest to stray as far from their bond as possible.. that has been the hardest thing on him yet, coming so close to losing his beloved companion. His child. But while he loses one familiar face, he gains another. Another that the empty, bloodied man has known for years. An intimate friend. This friend, it is like no other. It stands below our wild-haired friend's shoulders, possibly reaching a full fifteen hands if it were able to stand up straight. What was once a vibrant, healthy hue of yellowed dun painted onto the creature's body is now a sickly white; ribs nearly visible below paper-thin hide and festering sores. It smells of rotting flesh, what hair is remaining hangs limply in strands from both it's neck and tail bone. Lifeless black eyes that were once honey brown watch the world as it unfolds to our friend, and little to no cartilage leaves the creature's bones to grind against each other as it moves, often times making unpleasant noises. He should have recognized that voice, but it was all too real. You, dear reader, can imagine how hard this must be on our Voodoo. Can you not? Blended perfectly into the freshly powdered forest, Ouija watches him move uneasily, those dull red eyes that she had been born loving avoided something that she could not make sense of. Concern had gotten her into trouble in the near past, as had anger when she could not understand. Her bonded had completely turned. He was thinning out again from not eating (Frostfall was of no help, of course), refusing to sleep, telling this "Sarom" to leave him alone, pacing anxiously. Now, Ouija had always been aware of her bonded father's mental disorders, but he never allowed her to know exactly what it was that was going on inside of his head. Their bond allowed her to feel his physical and emotional pain. It had lead to her own mind dancing back and forth from happy to anxious, to painfully lonely to furious. She had experienced it all along side with him. Yet, the unicorn refused to let her see what he does. To hear what he does. For that, she knew she should be thankful. But how can one be thankful for their own sanity when the other half of them was sinking lower and lower? His jaws flexed tightly and Ouija's small chest began to burn with anger, or grief? Grief of what? The man with the messy curls of hair dropped his long face between his shoulders, letting out a deep breath which momentarily hid his features from the lurking fox. Her own sadness began to pull itself over her body like a heavy blanket. All the snow fox knew to do at this point was leave him be. Without a word, Ouija spurred to the left, wandering further away from her bonded. Muscles twitched beneath a thick gray coat, the cold still stinging his thin legs while the sun tried its hardest to kiss the earth and its inhabitants. His jaws clenched and relaxed in a steady rhythm - something to keep his mind distracted - as they moved as a pair. The creature limped along, flies buzzing around an open green sore on it's sharp left hip bone. Whether the skin had finally gotten thin enough to break, or if the combination of the infection and flies dining on his diseased hide were what had allowed it to split open, Voodoo was not sure. What he was sure of though, was that Sarom had not stopped staring the entirety of the walk. Silence. The only sounds were feet grinding down ice, and bone grinding down bone. Finally, it broke the comfortable silence. 'We've been here.' it hissed, a green tongue drooping lazily from an unhinged jaw. The grulla's skin crawled, this throat tightening nervously while he searched his mind habitually. "I have been here." the stallion merely whispered what was supposed to be a confident, threatening tone. Tired maroon eyed scooped up from the frozen ground, falling on the elegant runes. From above, the glass ceiling was covered in fresh powder, creating a closed dome. He recalled finding this place before, but with who? And when? Ouija pouncing on the dancing lights played in his head; so many beautiful colors, the joy on her young face, the smile on her little dark lips. It all seemed to long ago. The image contorted into shadows and a weak flame flickering in a dim cave, and an iridescent egg cracking open next to what had appeared to be a rotten, green egg. Both produced a canine-like creature; the day they had found each other. For a moment, a smile twitched on the blood splattered lips of our friend, the first taste of happiness he had been fed in weeks. Matte eyes fluttered, endless pupils searching for the white fox to no avail. She was out there somewhere, watching. She always is. Hooves clack onto the stone, your dual toned ears flipping toward the direction. The deteriorating man passed between the elegant curtains that hung carelessly on either side of the wide door. Flesh dropped from an unknown area of the creatures body, slapping onto the beautiful stone with a grotesque slap. 'Oh no, boy. WE brought you here.' it hissed into the darkness beneath the snow dome. Sorry to anyone that's used to reading my usual writing style for Dooey. I decided that this very huge change in his life needed to be narrated differently. Please forgive me if I've left a few incorrect terms in here, this transition is pretty hard for the both of us. And for anyone who is interested in replying, just note that "Sarom" is the last surviving figment of his imagination. His hallucinations have gone from auditory to full blown and is now effecting all of his senses (including his "smell", which Voodoo lost at an early age), so your characters will be completely oblivious to his presence. I will shine to guide you. There is nothing in particular that leads the blue mare towards the familiar copse of large trees. Perhaps it is a subconscious need to be in a place where the promise of hope is unmistakable, where maybe (just maybe) she will finally be rid of the awful seed of suspicion that has taken root in her heart. Whatever the reason, Tiamat finds it harder to be burdened by worries the further she travels, wandering with her beloved companion among the white, frosted landscape. Happily they weave through the thick, snow-covered trees, until the oceanic pair eventually comes around a curve where the forest gradually thins, leading them gently towards an ancient, lone structure. At the sight of the strange stone building, Nimue wanders ahead a little bit, eyeing the pavilion with her baby-blue eyes before glancing back at her bonded. Being just over a season old, the young Leviathan has never seen something like this before—the only structures she has seen are the colorful tent in their mountain home, and the ruins of the great Sentinels that once guarded its entrance. Smiling at the curiosity that pulses through their connection, Tiamat comes to stand by the little whale, arching her neck over Nimue’s back as she gestures towards the old building. “That is the Ancient Rotunda,” she says as she briefly pulls the Leviathan into an embrace, “I don’t know much about it, to be honest. Lena and I have speculated about its origins, because it must have been grand, but I don’t know for sure—I like to think it was once a gift from the gods.” Beneath the cold light of the sun, Tiamat’s eyes sparkle with wonder, imagining all of the fantastical possibilities. Sighing to herself in a cloudy, white breath, the blue mare’s eyes are drawn towards the space between the ancient pillars. She can’t say for sure, but it looks like there is a shadowy figure moving among them. Slanting an ear towards her companion, Tiamat shifts her weight, and extends a cloven hoof forward. “I think there is someone inside,” the Mender muses aloud, glancing to Nimue before sauntering around towards the rotunda’s entrance. “Hello?” Tiamat calls out when she reaches the entryway, uninhibited by black fears or dark secrets, her velvet muzzle pushing the curtains aside with little hesitation. As she had suspected, a stallion stands before her. “Hi there,” the ocean mare greets the stranger with an amiable smile on her lips, her doe-eyes alight with kindliness. She steps confidently onto the archaic stone floor, ever eager to make new friends, with the young Leviathan silently in tow (much quieter than her bonded, she hovers at Tiamat’s flank, peeking shyly around the mare’s hip). As the distance between herself at the dark stallion dwindles, Tiamat’s practiced eye takes note of his less-than-hearty appearance; which, admittedly, isn’t entirely unusual for Frostfall, but the mare cannot sit idly by if she can do something (anything) to offer some aid. “My name is Tiamat, I’m a healer for the Aurora Basin. Perhaps I can help you, if you would like?” The mare’s smile softens warmly, her white eyes shifting briefly to the snowy forest outside. “Winter can be so harsh sometimes, can’t it?” She takes her head with a breath of laughter, not wanting to cause the stranger any unease. More footsteps. Our friends ears pull back, listening to the soft crunch of footsteps outside of the halfheartedly closed rotunda. "Hello?" the voice is muffled by the thick curtains hanging from the colorful ceiling. The man's deep, endless eyes search for the new voice, his dark face turning over his left shoulder just as a stranger parts the curtains. "Hi there," the woman grinned and moved toward him without a pause. The light flitted through the room, casting weak colors from the ceiling onto the upper halves of the beams. A weak smile pulls the corners of his maroon lips up, right eye hidden behind his wild hair. Something hovers close to the blue woman's hip and our dear boy, confused as he is, narrows his eyes at the animal. An animal with no legs... it's just sitting there, in the air? Voodoo blinks hard, hair sticking to thick eyelashes as he does so. What is that thing? While he ponders on what this thing may be, the stallion swings his back end away from the stranger, chipped hooves scratching lazily across the stone floor until he is nearly faced the stranger. Sarom steps to the side, its eyes having finally left the grulla and staring through the woman with the shells in her hair, its green tongue poking out between the remaining teeth that reside in its fictional skull. Once the woman, Tiamat, has introduced herself, Voodoo's ears flop forward like a lazy mule's, tipping oddly to one side or the other. "-I'm a healer for the Aurora Basin," she adds. A dim light sparks somewhere in his mind, where they would once rifle through stashes of old, dusty memories, one pulled itself forward. 'We lived there once.' his decaying partner noted, the stench of his breath filling the air around them. Trying his hardest to ignore Saram, Voodoo nodded once, the smiling having fallen limp on one side of his face, leaving a smirk on the other. A moment of silence followed Tiamat's words before she continued. "Winter can be so harsh sometimes, can’t it?" The dark coated man grinned again, a "huff" coming out as a single laugh. "Do I look that bad?" The wild man tried to run a joke off of the kind woman's words, hoping that she too would find it amusing. 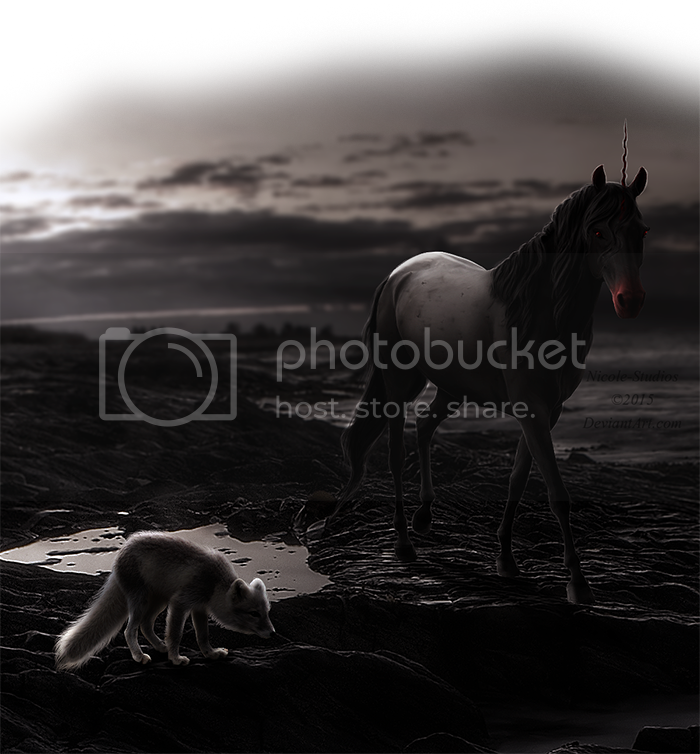 Behind the unicorn, the rotten man of his mind rolled it's deep black eyes, turning to face away from the conversation. "I-I'm Voodoo." he stammered. After all this time, the boy was still too shy to talk to women. Empty eyes dropped from the blue stranger to her side, watching the floating creature.. trying to decide whether it were actually there or not. "I'm from there. Well, no. Uhm. I was there when I was uh, just a kid." he spoke toward the animal with the flippers, distracted. Uncomfortable and unsure of how to decide whether the animal was real or a figment of his imagination, the stallion gritted his teeth quietly between his jaws, shivering at the noise they made as they squeaked. Shifty eyes darted back up to try to find Tiamat's, hopeful that his odd staring would either go unnoticed, or she would be able to ignore it if it hadn't. A half-grin still sat on his lips, waiting for the healer to speak again. The apparent collage of emotions that twists across the stallion’s face does not go unnoticed by the ocean mare, though she couldn’t hope to understand what he might be feeling—even if she knew what was troubling him. While the Rift God wars had forced upon her the first bitter taste of the darkness of the world, her sheltered mind couldn’t fathom how deep those shadowy chasms can entrench themselves across someone’s heart and mind. As far as she is aware, the ocean maiden has led a blissful and pure life, living in a world that is far too fragile for reality. All the same, her heart goes out to this stranger, her healer’s soul ever selfless. She watches him, white eyes glittering with genuine concern, the weight of her body leaning absently in his direction as every fiber in her being calls for her to soothe, aid, and mend whatever might be broken (physical or otherwise). A smile curves its way easily across sapphire lips when the stallion finally speaks (and she notices how his attention seems to be swallowed by her oceanic companion—he is not the first, and Tiamat is sure he won’t be the last). “Don’t worry, I’ve seen much worse,” the mare assures him with a crooked grin, a thread of laughter lacing her tone. Of course, this simple statement surfaces memories that her delicate mind would like to forget (memories of bloodshed, violence, chaos, and hate). Never before had the Mender felt so helpless and small as she had stood among them, crying for it to stop, for them to stop, but still the ugliness had raged on. Every distraction is a taste of relief from the nightmares. With doe-eyes tracing the handsome lines of the stallion’s face, she grasps for her own distraction, as little as it might be in comparison to his demons. Still, like a balm for wounds, her smile comes effortlessly. “A pleasure to meet you, Voodoo,” Tiamat offers him a friendly inclination of her horned brow, one of her ears tipping forwards to hear his voice over winter’s low howl. Surprise lights up her expression when he reveals that he, too, had once lived in the Basin. “You were? The world can be such a small place,” she tosses her head with an airy giggle. There are numerous questions that bubble to the tip of her tongue, feeding her curiosity, but perhaps it is time to satiate Voodoo’s apparent curiosity. The Mender allows silence to momentarily fall between the two of them, giving Voodoo time to process this new information (and, mostly, to give a polite enough pause before she rushes back into her own questions). Shifting her weight on the stone floor, she eventually continues: “If you don’t mind me asking…why did you leave the Basin?” The highland valley is so very dear to her, so it is difficult for her to understand why anyone would want to leave. “Where do you live now?” Tiamat questions him with kindly interest, not intending to probe as her eyes sparkle beneath the colorful lights.